I grew up in and around the mountains of western North Carolina and Tennessee. My Father was raised in the papermill town of Canton. Over the years, our family has moved from place to place in Tennessee, Georgia, and New York, but we have always considered the Smokies to be our home base. There are three sides to my family, my mother's family, my biological father's family, and my adopted father's family. My biological father was killed in a plane crash when I was only twenty months old, but I'm still very close to that side of the family. They're mountain people, too, just a little further to the west in Nathrop, Colorado. My grandmother on that side lived to be just four hours short of 100 (d. February 2001). Though Granner's body was frail, her mind was sharp to the end. She led an interesting life. She was listed on the Dawes roll of the Cherokee Nation (western band). She left Venita, Oklahoma, at the age of 15 to marry my grandfather, John Bernard Sangster. When I was young, I'd spend summers with them in Colorado, hearing their stories of the early Colorado mining camps and homesteading in Oklahoma. My own memories begin with my mother and my new father, a young Episcopal minister, in a tiny mission church in Monteagle, Tennessee. As our family grew, we moved to progressively larger communities and churches. Today, Dad is the Rector of Trinity Church, Wall Street, in New York City. I'm proud of these accomplishments mainly because of the distance I have come relative to where I began. I actually flunked first grade and spent grades 2-5 as a full-time special education student. I'm dyslexic and have a number of other perceptual challenges that special education helped me learn how to transcend. 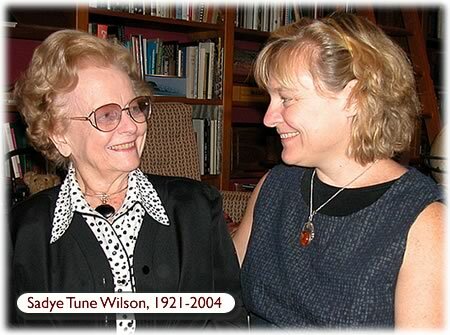 My wonderful special education teacher, Dr. Sadye Tune Wilson (1921-2004), mentored and nurtured me for over 40 years. She was like a second mother to me. One of our two girls takes her middle name from "Say Say." My adolescent and adult life has been filled with a range of adventures--from studying stone carvers in the south of France to Kali worshippers in Trinidad; from helping the Archbishop of Canterbury to download his email to helping refugees in Arlington, Virginia, to post their life stories online; from Anthropological fieldwork in my own backyard of Western North Carolina to travelling with my husband to Cambodia to adopt our two little girls. My love of adventure has been a factor in my embracing the promise of online multimedia. I’m especially interested in the role of culture and community in online learning. My areas of professional expertise include ethnography, oral history, documentary fieldwork, multimedia production, qualitative assessment, curriculum development and instructional design. I've enjoyed working in a range of settings as a museum curator, ethnographer, producer, university professor, and writer. A number of the exhibits, videos, and web sites I've produced have won awards, including The South Carolina Governor's Award for the Humanities, The American Association for State and Local History Merit Award, and the American Folklore Society's Dorothy Howard Education Award. In December of 1998 I joined the Northeastern University's Educational Technology Center as Projects Manager. I developed projects that explored creative ideas about teaching and learning with technology. In that capacity, I collaborated with with faculty, EdTech Center staff and co-op students to develop instructional software and computer-mediated educational resources. In addition to brainstorming innovative projects, I also strategized methods for quality assurance and project evaluation, mentored students through our cooperative education and program, taught workshops on multimedia project development, and edited an e-journal called Colearning: Partnerships in Technology. In the spring of 2000 I left Northeastern to join TERC as the Online Learning Specialist for their Masters in Education Program, a joint venture between TERC and Lesley University. In three and a half years, with National Science Foundation funding, we built a fully online Master's Degree program in Science Education for K-8 educators. In November 2003 I joined Simmons College as Senior Instructional Designer for Academic Technology. For more information about this position, see the "present" section of this web site.